ARC is thrilled to have lead the Hispanic/Latino (which ever you prefer!) Active Relationships Project (HARP) grant in the Rio Grande Valley of Texas. Our curricula were taught to over 4,800 families, most classes taught in Spanish. Welcome beloved Spanish-speaking communities! ARC se enorgullece de haber dirigido la beca del Proyecto Hispano de Relaciones Activas (HARP) en el Valle del Sur de Texas. Nuestros programas fueron enseñados a mas de 4,800 familias, y la mayoría de las clases en el idioma español. Le damos la bienvenida a nuestra querida comunidad Latina! Active Relationships Center has been active in Hispanic/Latino communities since 2004 when it initiated pilots in seven Texas cities. Trainings were conducted for Hispanic leaders who launched classes in their respective communities. Later, ARC applied for federal funding on behalf of the border community of Cameron County, Texas, deep in the heart of the Rio Grande Valley. Hispanic Active Relationships Project (H.A.R.P.) was awarded federal funding and has since served 4,800 Hispanic families. The project focuses on helping couples and marriages but also serves youth and families, including military families. For several years, Active Relationships Center has been working with Head Start families to improve the life-skills of both Head Start children and parents. We are also proud to say that Head Start programs across the U.S. have utilized our programs in Spanish. Active Relationships Center is proud to announce that we serve many Christian denominations. Our faith-based programs are widely used by Hispanic communities. Through our Hispanic outreach we also offer classes in Spanish at male detention centers and female detention centers. H.A.R.P. partnered with Baylor University to provide research and evaluate the success of its programs. As part of the research, Baylor University completed an analysis of participants’ perspectives and skills they learned. Evaluations were conducted on an annual basis from 2006-2011. Bringing an Active Relationships Master Trainer to your organization is easy! We offer a variety of different relationship and emotion management skills-based events, including retreats and professional certification trainings in ARC curricula. Call ARC headquarters, explain your needs and request a proposal. We are pleased to offer a variety of different types of professional certification trainings, youth retreats, and a combination of both. ARC has the capacity to implement a 12-session course for your middle and high school students district wide. Your district officials determine where, when and how many and ARC will work to provide the materials and the experts. 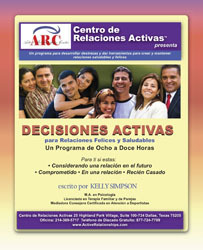 Hispanic Active Relationships Project (H.A.R.P.) was 1 of 124 Department of Health and Human Services (DHHS) marriage education grantees. With a goal of serving over 1,000 couples per year in Cameron County, Texas, H.A.R.P. helped strengthen marriages, prepare couples for marriage, and teach youth skills to build and maintain healthy relationships. To learn more about the great things H.A.R.P. accomplished in Cameron County, please visit the H.A.R.P. website. ARC’s Active Adults and Active Families curricula help Dads learn important information to help them be better Dads, how to stay connected with their kids, and how to manage difficult situations. At Active Relationships we have created workshops that give Dads tips and tools to develop skills to foster healthy relationships in a fun yet practical manner! One option is an adults-only class that is full of interesting information about personality types and skills for communication, compassion, forgiveness, resolving issues respectfully, and even skills for having fun! 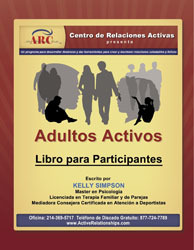 This class is called Adultos Activos. 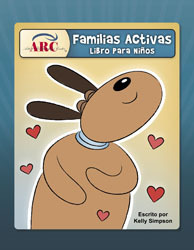 Adultos Activos books also come with a special book Especially For Fathers (at no additional charge), so be sure to tell our office when you order that yours is a class FOR DADS! For Dads with children in middle school or high school, there is another program we offer just for them. It is identical to Active Adults, except it uses the language of tweens and teens. It is called Active Relationships for Young Adults. Sometimes schools, grantees or faith-based organizations run Adultos Activos classes for dads in parallel with ARYA classes for their children. The other program for Dads is called Familias Activas. In the Familias Activas program, Dads and their children work together to learn skills and information about building strong connections through play and conversation. Fathers and children will learn how to communicate in a calm, respectful way, how to express emotion in a healthy way and how to plan together as a team. Active families celebrates the strengths of each and helps them recognize and build on great things about themselves! Sometimes Dads don’t always get a chance to have as big of a role in their children’s lives as they’d like. Familias Activas keeps Dads and children TOGETHER! This program involves lots of learning, lots of games and lots of building great memories and strong connections. It is for fathers and youth from ages three and up. Active Relationships Familias Activas curriculum helps Dads learn important information to help them be better Dads, stay connected with their kids and manage difficult situations. At Active Relationships we have created workshops that give Dads tips and tools to develop skills to foster healthy relationships in a fun yet practical manner! Familias Activas keeps dads and children TOGETHER in class! This program involves lots of learning, lots of games and lots of building great memories and strong connections. It is for fathers and youth from ages three and up. Familias Activas keeps Moms and children TOGETHER in class! This program involves lots of learning, lots of games and lots of building great memories and strong connections. It is for Moms and youth from ages three and up. No matter the age, there is something for everyone in our Active Families program. It contains content specifically designed for children, but also offers reminders for parents, caregivers and older youth as well, so everybody can learn valuable skills and tools together! The Active Families program also includes fun activities and games, which follow the lectures for each chapter. Each activity helps build stronger bonds between parents/caregivers and their children. Practice together, learn together, and play together! This program is available in Spanish Active Families is for parents/caregivers (whether single or not) and their children! The multiple versions (secular, Christian, English, Spanish, etc.) of Active Relationships for Young Adults (ARYA) (our youth programs) are a great way to improve attitudes and relationships at home and at school, and these programs extend to other situations as well, preparing participants for the future. Our curricula introduce and nurture valuable life skills that enable youth to improve their relationships and psychological health. Understanding how emotional triggers and stressful situations affect the body and mind is very important for youth. This allows them to learn good, healthy habits early on, paving the road to becoming a well-adjusted adult. Another important aspect of developing good habits early on is preparing for the workplace. Work can be very difficult, especially for youth who have not been well instructed on managing emotional upsets and triggers. The tools taught in our youth programs will help teens reach a whole new level of psychological strength. Our programs, which have been utilized in both schools and prisons, extend to troubled youth in juvenile halls and boot camps. All it takes to turn one’s life down a better path is a little instruction and a bit of practice. Even emotionally healthy youth may be helped by our curricula. It never hurts to practice and reinforce good habits! For an in-depth description of ARYA and other programs for youth and adults, you may view the Course Descriptions under the Products tab. ARYA is not currently available in Spanish, but the Active Adults curriculum has been used with Spanish speaking youth with great success since the lessons in it are parallel to the Youth curricula. ARC’s Active Relationships for Young Adults (ARYA) program has been successfully utilized to delay youth from sexual interaction and to deter teen pregnancy. 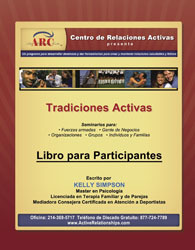 The standard ARYA program already contains information about how the human body can mistake chemistry for love, about being careful in choosing friends, about dating rights and dating safety, about remaining abstinent until marriage, about qualities to consider in a lifelong partner, personal goal setting and self-discipline in emotions and in relationships. In addition to the standard ARYA program, some federal grantees have chosen, with ARC’s collaboration, to also include in their project, medically accurate information about sexually transmitted infections. For example: two independent El Paso area school districts working under a federal CBAE grant awarded to the Medical Institute for Sexual Health in Austin Texas, initiated a project called Paso a Paso with the purpose of promoting abstinence until marriage while developing healthy relationship skills among youth ages 12-18.